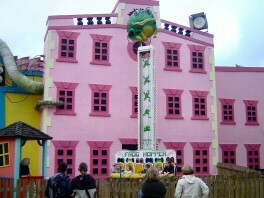 Although it looks like a temporary feature, Frog Hopper has been in Cloud Cuckoo Land for a few seasons now. A simple children's ride, it seats up to six people. The carriage simply goes up and down, in a jumping or hopping motion, thus the name. The queues are never very long for this ride, and the kids will enjoy, what to them is a white knuckle ride.